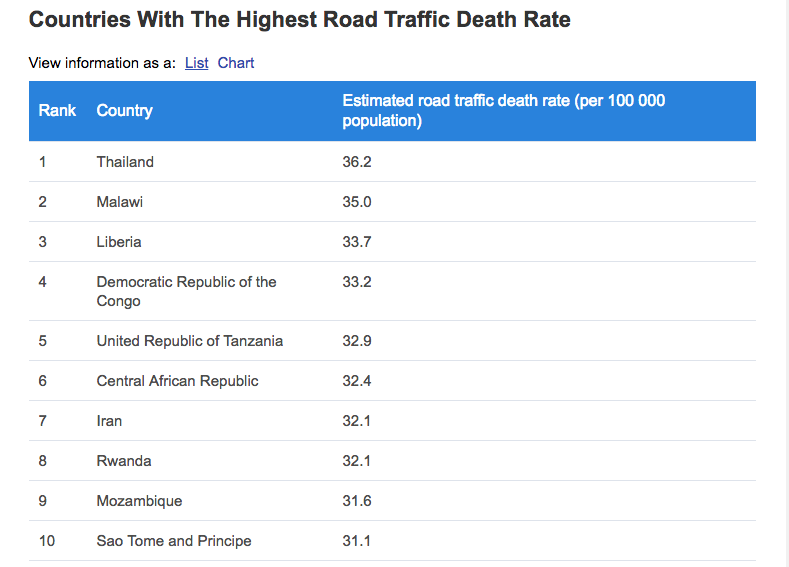 A new report has ranked Thailand as having the world’s deadliest roads. According to the report, Thailand ranks in first place with an average of 36.2 deaths per 100,000 population, ahead of Malawi in 2nd place (35.0) and Liberia in 3rd (33.7). The other countries that make up the top 10 include Democratic Republic of the Congo, United Republic of Tanzania, Central African Republic and Sao Tome and Principe. The report is the latest to highlight the carnage on Thailand’s roads. Last month, figures revealed at a meeting of road safety experts showed that the death toll on the nation’s roads jumped dramatically last year. At the meeting it was revealed that the death toll on Thailand’s roads in 2016 was 22,356 – that was 2,877 up from the figure for 2015 which was 19,479. Also last month, more damning statistics issued by the Don’t Drink Drive Foundation revealed that on average 61 people are killed every day on Thailand’s roads. The news comes after Thailand’s government vowed to invest in safety measures to help reduce the 20,000 deaths and estimated Bt500 billion in financial losses every year. Under the measures, officials said they would crackdown on drink driving and people breaking the speed limit, The Nation reported. And children from kindergarten age will be taught about road safety. "Most-hated German In Thailand" On His Way To Laos ?